Doug Noon just posted a wonderful holiday greeting from E. B. White. Thank you, Doug. In that spirit of sharing on a special day, here's a poem, and a story that came our way today, on Christmas. My wife and I were midway through our walk through our neighborhood park, and I thought the home-brewed stout I had in my pocket would have to wait for another day. But out of the corner of my eye I saw Chris. We called out, waved, and I ran over to him. I delivered the stout a little sheepishly (you would too, if you were delivering one you made to an Irishman who knows a good stout) . It has become a bit of a tradition. WHERE SQUIRREL'S, THEIR NUTS AND GRASS. our god for all we see. The comment is so Chris, the ultimate Irish philosopher and nature lover. Added by hand with a manual typewriter, I'm pretty sure. If there were ever a time to think about this, it would be now. 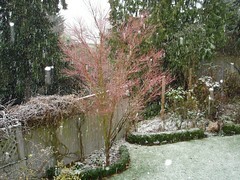 It's snowing at the moment in Seattle - hard - on Christmas. Unbelievable. It's snowing here, too. But not hard. Tiny flecks hang in the air all around, uncertain about where they'll come to be. It covers up the old we've taken for granted these last many weeks. New again, and time for another round. Merry Christmas, Mark.